Fiat is not currently in talks with the VEBA to buy its remaining holding in Chrysler, Marchionne said Friday. Fiat S.p.A. plans to pay less than 200 million euros ($253 million) to increase its stake in Chrysler by 3.3 percentage points to 61.8 percent, Fiat CEO Sergio Marchionne said. Fiat has an option to buy a 3.3 percent stake in Chrysler from a retiree health care trust affiliated with the UAW beginning in July. Marchionne, who is also CEO of Chrysler, said last month there was a "better than 50 percent chance" that Fiat would hike its stake in Chrysler. Fiat has sent a letter to the trust to exercise its option, Marchionne said today in an interview outside a Madrid hotel. Fiat is not currently in talks with the VEBA to buy its remaining holding in the U.S. automaker, Marchionne added. Fiat acquired management control and a 20 percent stake in Chrysler three years ago as part of the automaker's government-funded bankruptcy. The Italian automaker has since raised its stake in Chrysler to 58.5 percent. The VEBA, which is not managed by the union, owns the rest of Chrysler. The VEBA's stake in the U.S. automaker is managed by an independent fiduciary. Fiat can buy a maximum of 3.3 percent of Chrysler from the trust every six months. The option expires in 2016. The trust "is not a natural shareholder" and will want to sell its stake, Marchionne said last month. "I'm happy to help them with that." 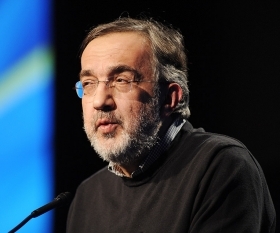 Marchionne plans to eventually merge Fiat and Chrysler in a bid to increase sales to more than 100 billion euros by 2014 and reduce the Italian manufacturer's reliance on Europe. But he said today there won't be "any spectacular news" on a full acquisition of Chrysler in the second half of 2012. Fiat said today it was slashing investments in Europe by 500 million euros ($632 million) on expectations that the region's auto market won't rebound in the second half. Fiat is forecasting net profit of 1.2 billion euros ($1.50 billion) to 1.5 billion euros for the full year, and a trading profit of between 3.8 billion euros and 4.5 billion euros. Marchionne confirmed those targets last month despite a stagnant Italian economy and the uncertain outlook in Europe. U.S. growth has bolstered Fiat's bottom line, offsetting weakness in Europe and in Italy.